Eyes Turn to Bernanke at the Fed When Ben Bernanke takes the reins of the Federal Reserve from Alan Greenspan, he will instantly become one of the most influential people in the world. Bernanke knows the Fed inside out, but that's very different from being the sheriff of the global economy. When Ben Bernanke wakes up on Feb. 1, his life will never be the same. As it stands, he is a moderately famous economist known for his fair-mindedness and intellectual firepower. But when the 52-year-old Bernanke takes the reins of the Federal Reserve from Alan Greenspan, he will instantly become one of the most influential people in the world. Read a Greenspan timeline and see a snapshot of the economy during his era at the Fed. Financial markets will parse every public word he utters, sometimes rising or falling on a single phrase. 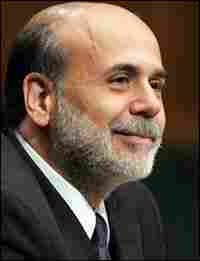 Politicians in the U.S. will scrutinize Bernanke for any hint of partisanship. His face will become recognizable to readers of People as well as subscribers to The Economist and Fortune. Consumers may pay attention or not, but their mortgages and the prices of the goods they buy will all be affected by the choices made by his Federal Reserve. The world will be watching, judging Bernanke, comparing him to Greenspan, looking not just for sound judgment, but for wisdom. Probably no one is more aware of all this than Bernanke himself. After a distinguished career at Stanford and Princeton, where he became one of the leading authorities on the Great Depression, Bernanke served three years on the Fed's policymaking committee. President Bush named him chairman of the president's Council of Economic Advisers. And in October, he was nominated to head the Fed. Interest Rates: The Fed has raised short-term rates 14 times since the middle of 2004. Many forecasters are expecting Bernanke to keep it going with one or two more rate hikes, before stopping. The bond market, always watchful about inflation, will pay especially close attention. The first meeting of the Bernanke Fed where rates could change is at the end of March. Getting to Know You: Bernanke's first scheduled appearance before Congress as chairman is on Feb. 15. Expect him to be more concise and direct than Greenspan when talking about the direction of the economy. But don't count on him to venture an opinion about anything politically controversial. Housing: Rising mortgage rates have taken the fizz out of the bubbliest housing markets. Most economists expect home prices there to flatten or decline modestly. But if home prices in those areas crash, will Bernanke intervene by aggressively lowering rates? Or will he let the market take its course? Energy Prices: So far, the economy has absorbed high energy prices surprisingly well. Oil at over $60 a barrel hasn't torpedoed growth and inflation is constrained. But global energy supplies remain tight and a significant disruption could send prices skyward and deal a nasty setback to the economy. Bernanke knows the Fed from the inside out, but that's very different from being the sheriff of the global economy. The last two Fed chairmen, Greenspan and Paul Volcker, were towering figures who shaped the economy by force of personality as well as their policies. By all accounts, Bernanke's manner is unassuming. He deflects attention away from himself, if not his ideas, and he likes to lead by consensus. When it comes to politics, even some of his closest colleagues didn't know he was a Republican until President Bush tapped him as his top economic adviser. BORN: Dec. 13, 1953, in Augusta, Ga. There's some evidence to suggest Bernanke would like to see a different kind of Fed, one where clout is seen coming from the institution itself rather than from an all-powerful chairman. He is a longtime champion of something called inflation targeting. That means the Fed would set an explicit goal for future inflation, say somewhere in the neighborhood of 1 to 2 percent annually. This would take away some of the mystery of the Fed's inner workings. Changes in interest rates would become more predictable. The Fed's inflation-fighting goals would be a matter of record rather than a secret formula locked inside the chairman's brain. It's not clear whether Bernanke will make a stand to adopt inflation targeting, at least early in his term. Nearly two dozen countries use it, some quite successfully. But Greenspan never seriously considered inflation targeting for his Fed, feeling it would limit his flexibility. Bernanke's political reticence may be another sign that he'd like to run a less personality-driven Fed. Greenspan rarely hesitated in offering opinions about matters outside of the Fed's domain -- whether on tax cuts, trade and globalization or deficits. The new Fed chairman is likely to be more circumspect. But as much as he may like to run Team Fed, when the Greenspan era ends… the Bernanke era begins. And when the next financial crisis strikes -- a hedge fund collapse or a currency on the skids -- all eyes will turn to the chairman, not to the marble fortress on Constitution Avenue where he works.